This entry was posted on May 12, 2014 by CLGenetics. 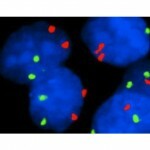 Let Cell Line Genetics characterize your cell lines using fluorescence in situ hybridization (FISH)! CLG offers FISH services for all of the probes listed under our FISH products including CLG StemCheckTM Probes! The CLG Human StemCheckTM FISH probes provide users with a quick and economic means to assess the occurrence of trisomy within their cultured Stem Cell lines. The StemCheckTM FISH probes target the 4 most common trisomies (Chr 1,12,17,20) that can arise during the culturing and passaging of ESC and iPSC lines. Cell Line Genetics’ Critical 4 (human) were identified by leveraging our library of Stem Cell Abnormalities obtained through the evaluation more than 17,000 cultured human iPSC and ESC lines. Since FISH analysis provides a cell-by-cell perspective of the overall cell population (single cell), users of the StemCheckTM FISH Probes will be able to evaluate for mixed populations.